True Economics: 29/5/2014: Earnings in Ireland: Something's Fishy in that Murky Water?.. 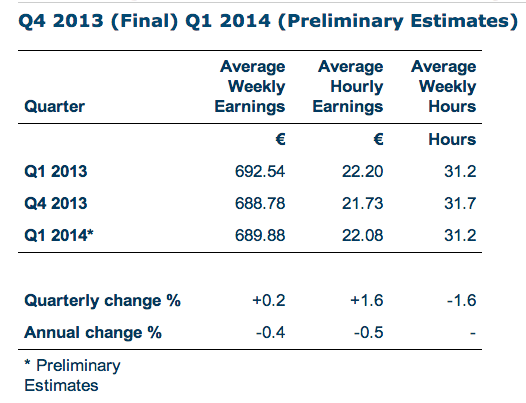 29/5/2014: Earnings in Ireland: Something's Fishy in that Murky Water?.. Average weekly hours and earnings were released by CSO this week, covering Q1 2014 data. 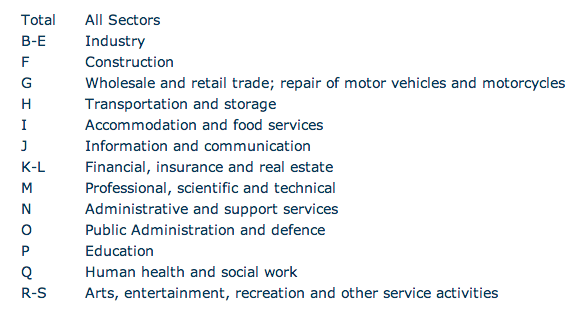 Remember, these are delivered in the context of reportedly growing employment and accelerating economic activity, right? Ok, top-line observations: y/y average weekly earnings are down 0.4% or EUR2.66/week (EUR138.32 per annum, assuming paid holidays and not adjusting for working hours etc, but you get the point: in 2013 a person earning average weekly earnings level of salary would have had EUR2,346 per month in disposable after-tax income, in 2014 they have EUR2,341 per month). Worse than that, the decline in weekly earnings was driven by a drop in average hourly earnings (down 0.5% y/y) against flat hours worked (31.2 hours/week on average). In other words, we are creating jobs in tens of thousands, but seemingly there is no pressure on hours worked and there is downward pressure on hourly earnings. Were these changes down to cuts in bonuses, perhaps? Well, no: excluding irregular earnings, average hourly earnings fell 0.6% y/y. So if you work in a job where bonuses are not present, congratulations, the economic recovery is biting into your earnings even more. It is worth noting that this trend is not uniform in the economy: private sector hourly earnings rose 0.6% but public sector earnings fell 2.5% year on year. And steepest increases in earnings took place in enterprises with less than 50 employees (+2.3% y/y), while steepest declines took place in enterprises with 50-250 employees (-2.9% y/y). Large enterprises saw average hourly earnings excluding irregular earnings fall 1.6%. Per CSO: "Across the economic sectors average weekly earnings increased in 7 of the 13 sectors in the year to Q1 2014, with the largest percentage increase in the Construction sector (+10.2%) from €639.35 to €704.41. The largest percentage sectoral decrease in weekly earnings was recorded in the Education sector (-2.7%) from €814.12 to €792.03. Between Q1 2010 and Q1 2014 average weekly earnings across individual sectors show changes ranging between -6.3% for the Education sector from €845.59 to €792.03 and +13.6% for the Information and communication sector from €915.94 to €1,040.10"
On last bit: average working hours were unchanged y/y in private sector, but up 2.3% in public sector. Which is worrisome - rising employment in private sector should lift hours ahead of numbers employed, by all possible logic, since hiring more workers is costlier than letting those employed work longer hours for the same or even higher pay. Still, hours are static y/y, and are up by only 0.1 hour on Q1 2010... Puzzling... 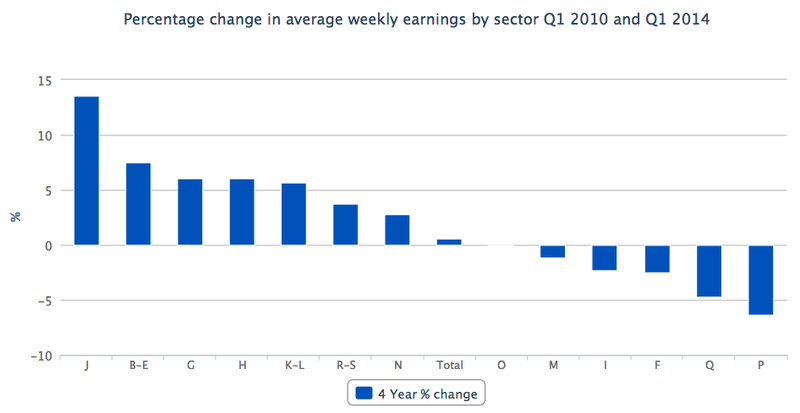 Worse: working hours are unchanged y/y and down on Q1 2010 for smaller firms, where wages pressures seem to be highest. Income tax receipts to the end of May 2014 published this week are approximately €480 million higher than the equivalent period in 2013.